Too Many Chefs in the Kitchen? We Don't Think So! 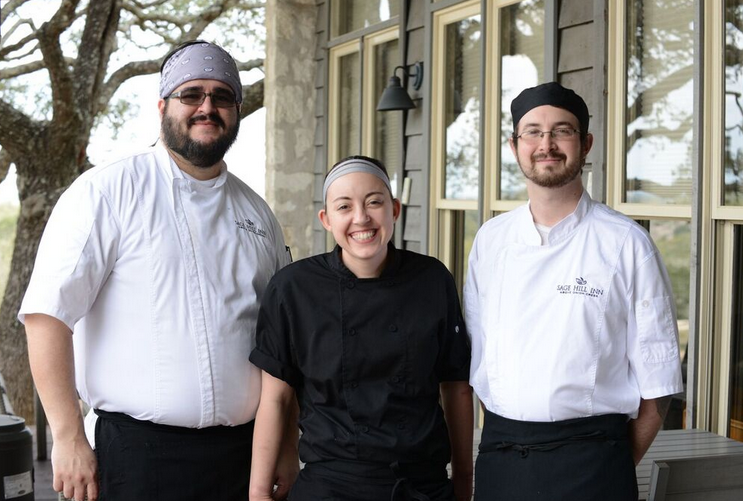 We've told you all about Executive Chef Autumn Wallace, now it's time to meet the rest of her team, Sous Chefs Fernando Duran and Quentin Vigneron. Duran graduated with a bachelor's of culinary management from The Art Institute of San Antonio. After participating in the openings of San Antonio's well known restaurants Sustenio and Arcade Midtown Kitchen, Duran moved to Austin and joined No Va Kitchen & Bar. A recent addition to the Sage Hill Inn kitchen, Duran's brings international influences to the restaurant's menu, including the bold flavors of his Latin heritage. A commitment to quality and providing the best customer experience, are paramount in his approach. Vigneron's culinary career includes positions at The New Albany Country Club, Plate-Restaurant and Catering, The Market Italian Village, Rhapsody Restaurant, and the Hocking College Hot Food Competition Team. All of these experiences have let him hone his classical cooking skills, while still developing a style of cooking that continually practices sustainability in the kitchen, and maintaining a menu around the availability of fresh, local ingredients. His mindset for food is to keep it simple but elegant, let your farm to table ingredients shine, and always focus on your guest's needs. Executive Chef Wallace recently commented on the new additions and said, "Both sous chefs have been extremely instrumental in helping me launch our new menu and dining concept for the restaurant. I couldn't have done it without their help and dedication to menu planning in the wee hours of the night! To change the way Sage Hill Inn has done dining for the past twenty years took a lot of planning and staff training, which they both have been a huge part of." What a team! Sage Hill Inn is so lucky to have them! Way to go Quentin Vigneron. Happy for you. nice post your way of explanation is good...excellent article,it was helpful to us to learn more and useful to teach others.This like valuable information is very interesting to read,thanks for sharing this impressive informative .